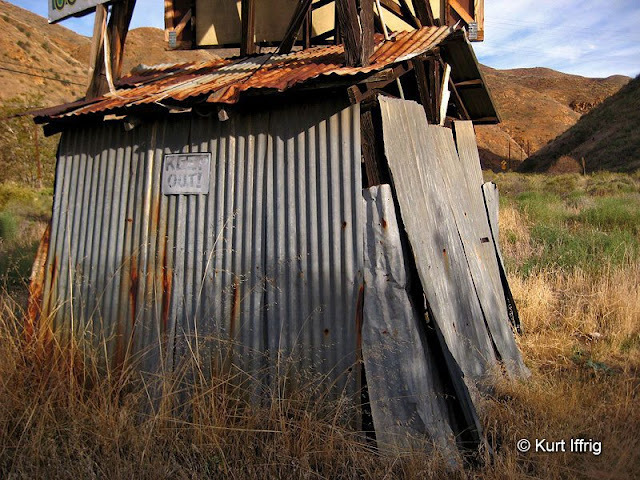 As of 2015 this was one of only two original stamp mills still standing in Los Angeles County. Depth: Originally there were two shafts, one was 140 feet deep, the other was 65 feet. Both are sealed. This is a five stamp mill. Small mining operations generally ranged from single stamps to ten stamps. 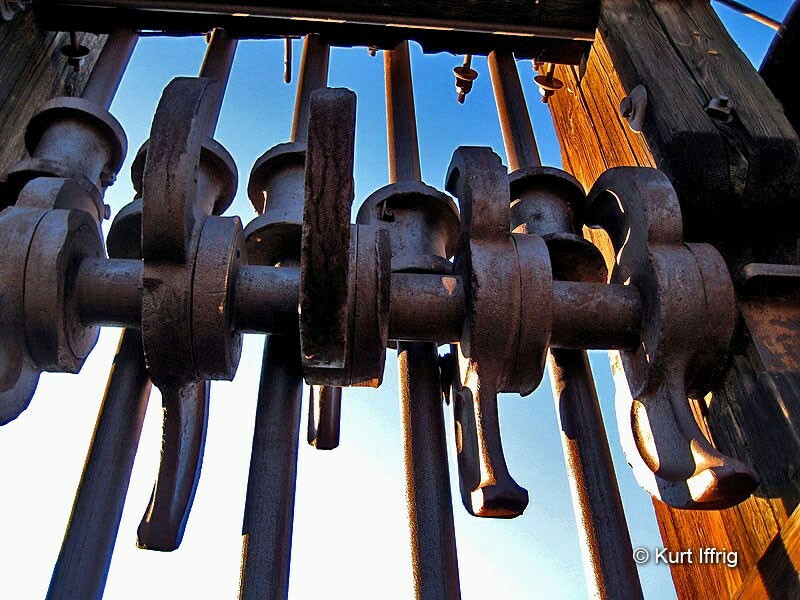 You’re looking at one of only two original stamp mills that still exist in Los Angeles County. This mill could be as old as 140 years, and it’s amazingly well preserved. Stamp mills were expensive to build and were usually dismantled when mines ceased operations, but for some reason this one still remains. Originally this mill would have had an exterior staircase with an upper deck. A few remnants of this exterior woodwork can still be found nearby. The only other known standing mill in this county is a two stamp near the Eagle Mine. The Eagle is extremely remote and difficult to reach. In fact, only a handful of people have seen it in the last 100 years. I have not been there as of yet, but have seen recent photo of the two stamp mill in front of the mine. It is still standing, but not in good shape. In the fairly recent past there was a third one standing near Tom Vincent's cabin, fairly close to the Big Horn Mine on Mt. Baden Powell, but it collapsed sometime around 2004. It was a single stamp mill. Most parts appear to be nickel plated and rust is minimal. This mill could probably be made functional again. 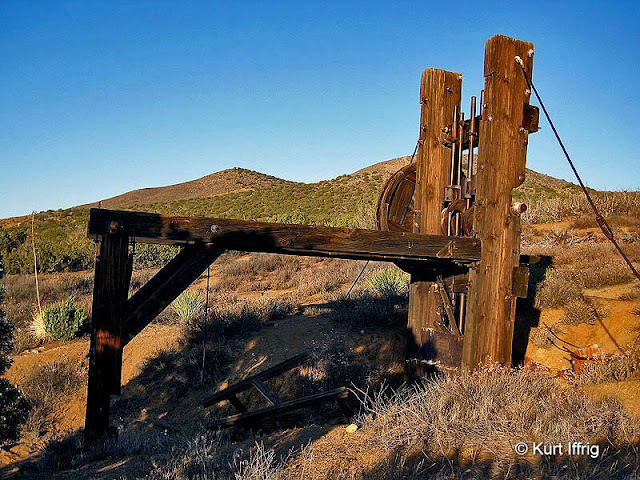 What Is A Stamp Mill? There were many types of mills used during California's gold rush, but stamp mills were considered state of the art technology for their day. Stamp mills, also known as stamp batteries were basically ore crushers that pounded rock into powder for the extraction of metallic ores. While some stamp mills were powered by water wheels, this particular one was powered by a Miner’s Boiler. The bull wheel on the side of this mill once had a belt that attached to the boiler which provided power to lift the stamps. If you would like to see what a Miner's Boiler looks like, I found one in the hills above Elsmere Canyon. Joshua Hendy Machine Works was a top technology leader for the mining industry during the late 1800’s. 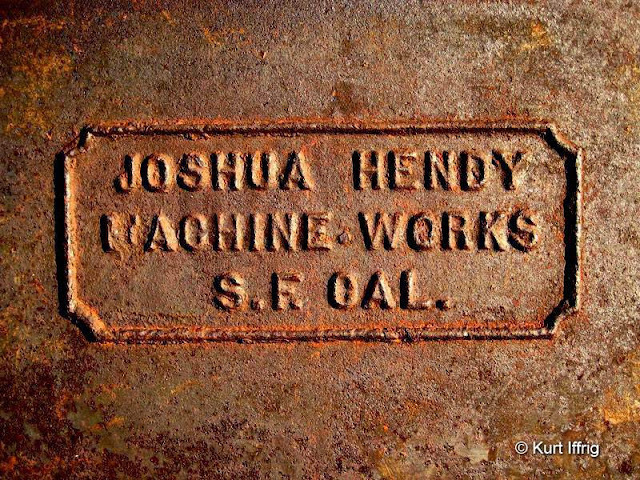 Joshua Hendy Machine Works was a subsidiary of Joshua Hendy Iron Works, an American engineering company that existed from the 1850s to the late 1940s. At one time it was the world leader in mining technology. In 1856, this San Francisco based company began to supply equipment to Gold Rush placer miners. They supplied ore carts, ore crushers, stamp and ball mills to the global mining industry. "The Baker Iron Works at Los Angeles are building an elegant stamp mill for Acton. That makes five mills now, and we venture to say there is sure to be one or two more added to this list." For a nice example of a stamp mill built by Baker Iron Works click here .... Wall Street Mill. The video above gives perhaps the best explanation I've ever seen on how stamp mills work. 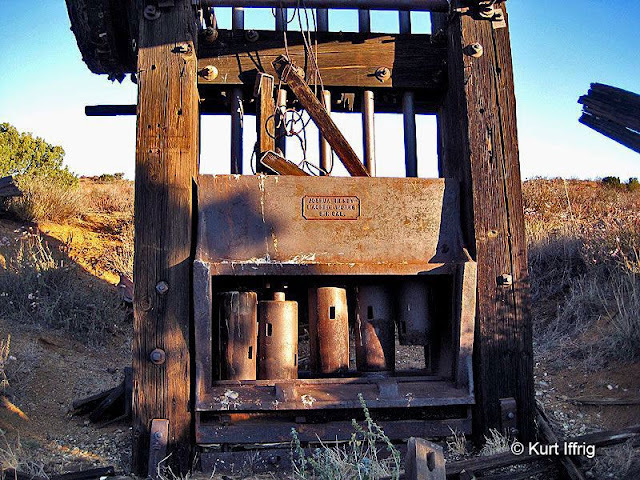 The mill in the video, located in northern California, is a five stamp mill, like the one found at the Puritan Mine site. In fact, it looks like same model made by the same company. The only thing different is the wooden housing, which was dismantled from the stamp mill featured on this page. Stamp mills date all the way back to the days of Rome, in the first century BC. Components for water powered mills - water wheels, cams and hammers were also used by the Greeks dating back to the third century. And they were used by medieval Persians as early as 973. By the 11th century stamp mills were widespread throughout the Islamic world, from Spain to North Africa. Aside from ore crushing, vertical stamp mills were often used for the forging of wrought iron. During the Renaissance Leonardo di Vinci often sketched trip hammers for use in forges. The oldest know European illustration of a martinet forge-hammer dates back to 1565 AD. The first stamp mill in the U.S. was built in 1829 at the Capps Mine near Charlotte, North Carolina. They became common in mining regions in the latter 19th and 20th centuries. 19th century advertisements highlighted the fact that these units could be broken down and packed in by mule to remote locations, then assembled on site with only simple tools. Californian stamps were based on the design of Cornish stamps developed in Cornwall for tin mining around 1850. This design featured cams that would rotate as they lifted, causing even wearing at the foot of the stamp. Smaller mills could be powered by water wheels, while larger ones required steam engines. I found this sealed shaft near the stamp mill, but I do not believe this one was related to the Puritan Mine. Puritan Mine was one of a number of gold mining operations in what was known as the Cedar Mining District, near Acton. The original name was Union Mine. Today there is nothing left of the original mine, which consisted of two vertical shafts, one was 140 feet deep, the other was 65. The Puritan was once owned by Henry T. Gage, the Governor of California from 1899 to 1903. 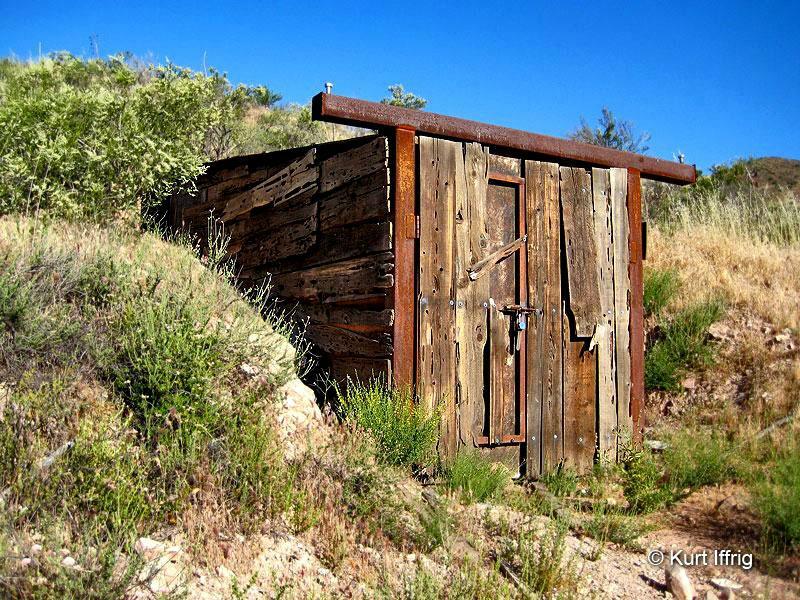 Gage owned several mines in the Cedar District and Soledad Canyon, including the Red Rover, Emma, Don, and the wildly successful Governor Mine. Puritan Mine was operational from the 1870’s through the early 1900s. Other mines in the Cedar District included the King of the West, Santa Clara, Savage, Cornet, Mammoth, Triumph, Whittier and Buena Esperanza. These were all minor producers. 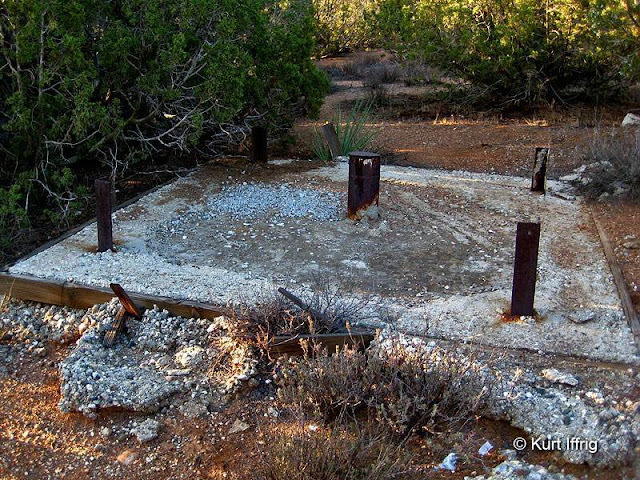 This is a sealed mine shaft I found near Acton cleverly disguised with a billboard on top. Acton is a sparsely populated rural town with a population of only 7,596. But it has a rich western history and a lot of old mines. This is not not in my neck of the woods, but I’ve made several trips out to this area and found many interesting items, including the sealed mine shaft in the photo above, made to look like a roadside billboard. On the inside there's a valve sticking out of settling dirt with gauges attached, possibly used to monitor methane and other gases coming from below. 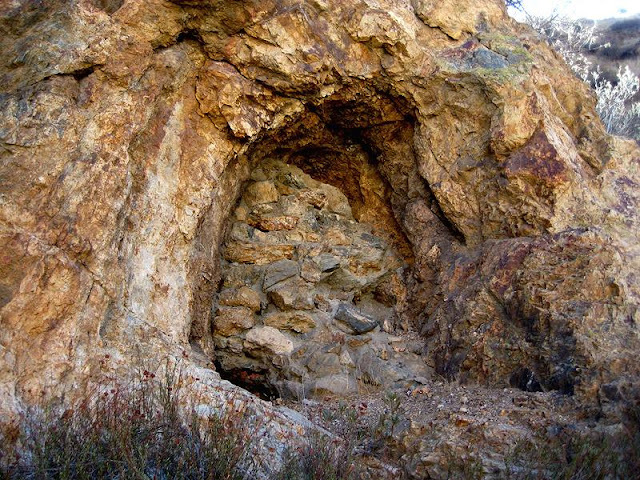 I found this stone sealed mine beside Sierra Highway in Agua Dulce. I have been told there are others nearby. I also found a small prospect in the next town over, called Agua Dulce, which can be seen in the photo below. I even found the shell of an original stage coach in someone’s front yard, minus the wheels. The names of these two mines are still undetermined. I have found several other sealed shafts in this area, with valves protruding from the surface similar to the sealed shaft above. The prospect in the photo below was locked, but peering through the wooden slats I could see that it did not go deep. Here's a small prospect I found in Agua Dulce, probably a gold mine. It only went in for a few feet.. 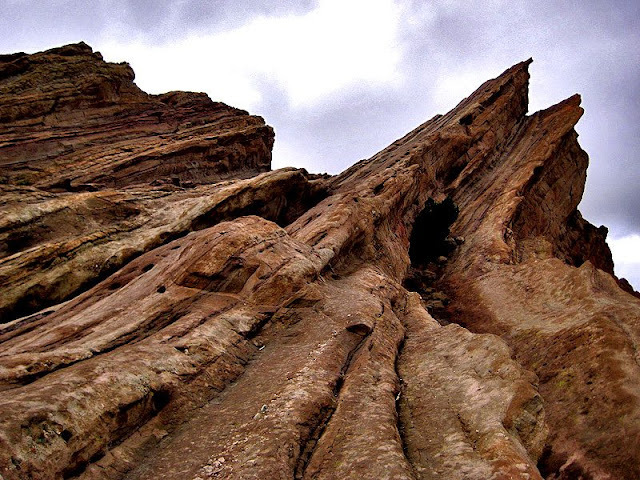 Located just a few miles from the Puritan Mine site are the Vásquez Rocks, beautiful rock formations named after the infamous Mexican outlaw, Tiburcio Vásquez. At one time he and his gang hid out here, in a cave that was sadly destroyed during the construction of the 14 freeway. 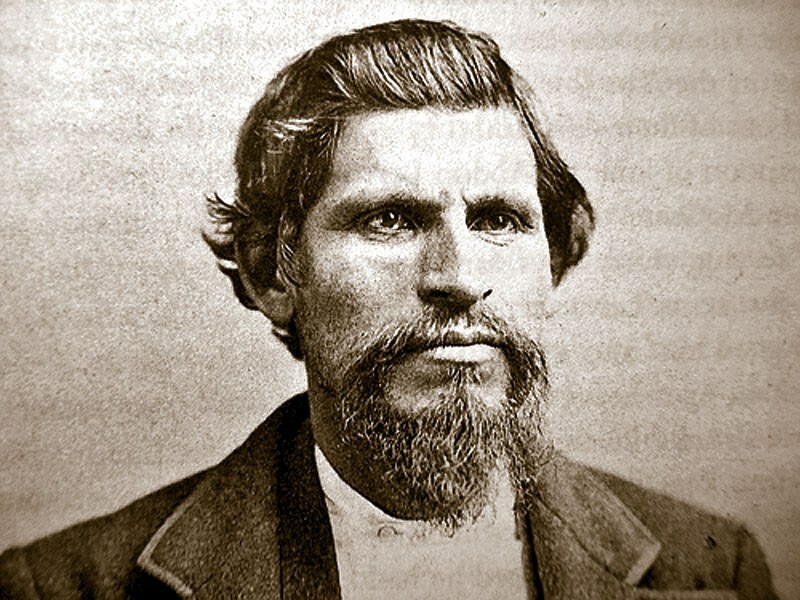 In 1854 Vásquez was present during the slaying of Monterey Constable William Hardmount in a fight with Anastacio Garcia. Although he denied any involvement, he fled the scene and became a wanted outlaw. Vásquez became a horse thief and was captured by a sheriff's posse in 1956. He would spend the next five years behind bars at San Quentin prison. During his incarceration he helped to organize, and participate in, four bloody prison breaks which left twenty convicts dead. After his release, Vásquez went on to commit numerous burglaries, cattle thefts, and highway robberies in Sonoma County. 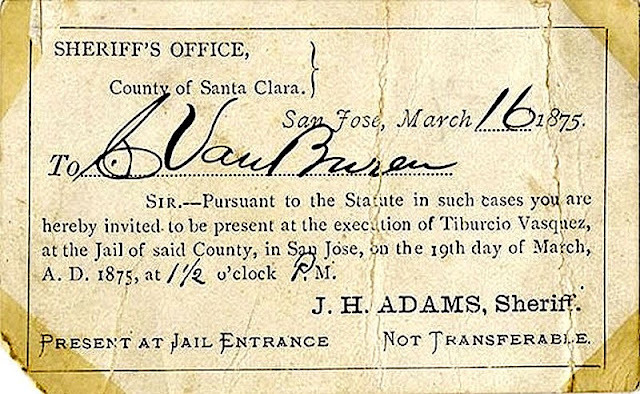 In 1866 he was captured again after a store burglary in Petaluma and sent to prison for another three years. Vásquez Rocks are just a few miles from the Puritan Mine, named after the famous outlaw, Tiburcio Vásquez. In 1870, Vásquez organized a gang. After numerous bandit raids, he was shot and badly wounded in a gunfight with Santa Cruz police officer Robert Liddell. He escaped and later recovered. 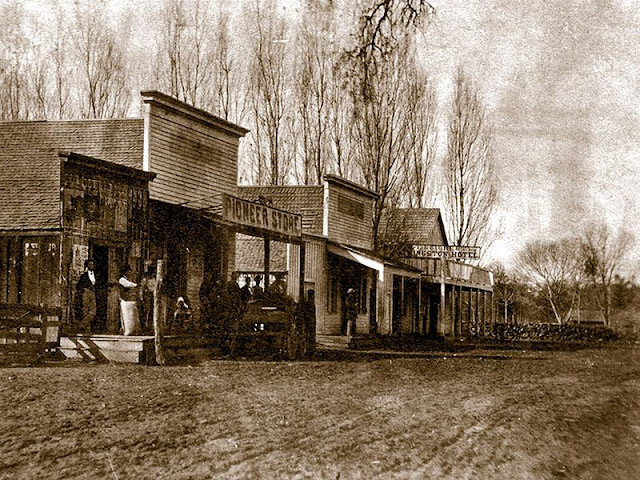 In 1873 Vásquez and his gang stole $2,200 from Snyder's Store in Tres Pinots, killing three innocent bystanders in the process. California Governor Newton Booth placed a $1,000 reward on his head. His band was pursued by a Sheriff’s posse, but again managed to escape after a gunfight. While seen as an outlaw by most, Vásquez became a folk hero of the Mexican-American community. The town of Kingston, raided by Tibercio Vásquez and his gang the day after Christmas in 1873. An invitation to the 1875 execution of Tibercio Vásquez was a hot ticket, and "not transferable". After taking up residence in Rancho La Brea, which is now West Hollywood, he impregnated the niece of a friend. The girl's family turned over Vásquez to the law. He was sent north by steamship to face trial, where he was convicted and sentenced to hang for murder. Vásquez claimed his that crimes were the result of discrimination by the norteamericanos and insisted that he was a defender of Mexican-American rights. He also claimed that his goal had been to return California to Mexican rule. An appeal to Governor Romualdo Pacheco for clemency was denied, and he was hung on March 19, 1875. He was 39 years old. Vásquez is thought to be one of several sources for the bandit-hero character Zorro. Tiburcio Vásquez, western outlaw, Mexican-American folk hero, and one of the inspirations for Zorro.